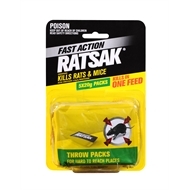 RATSAK Fast Action Throw Packs are individual, chew-through sachets that are ideal for tossing into those hard-to-reach places where rodents like to shelter and feed. Because the sachets are ready to use, there’s no need to actually touch the bait. As the weather cools down in autumn, rats and mice invade sheds and garages and move inside the house looking for food and shelter. Even garden plants can be attacked by rodents, with holes chewed in starchy storage organs such as bulbs, and in soft fruits like tomatoes and strawberries. And anyone who feeds wild birds in the garden will know the frustration of having much of the seed eaten by rats and mice before the birds have a chance to find it. RATSAK Fast Action is based on the active constituent brodifacoum, which is effective with rodent populations that have developed resistance to other rodenticides. 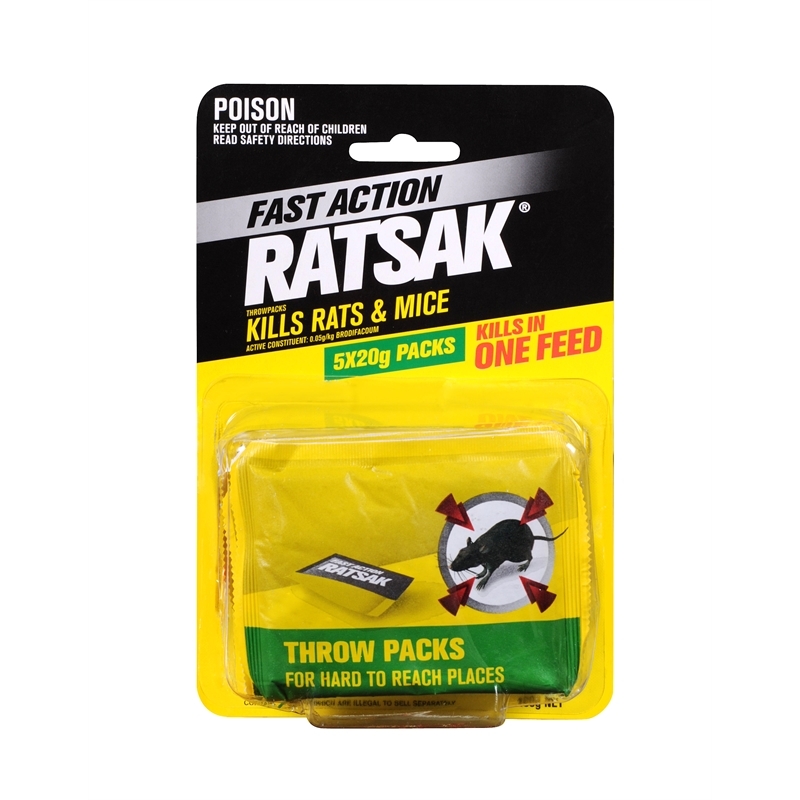 The fast acting active ingredient in the bait kills rats and mice in a single feed. RATSAK Fast Action Throw Packs can be thrown into inconspicuous locations (e.g. under floorboards, inside roof) where they’re unlikely to be contacted by children and pets. As an added safety measure, RATSAK contains a bittering agent that helps prevent accidental consumption. For more than half a century, RATSAK has been one of the best-known names in rodent control in Australia. And although rat and mouse control is not a pleasant topic, RATSAK Throw Packs make it easy to get rid of these pests with a minimum of fuss. RATSAK Throw Packs come in a 100g pack size that contains 5 × 20g throwpacks. Less than one gram will kill a mouse and 4-6 grams will kill a rat. Brodifacoum is a fast acting anti-coagulant which will kill rats and mice 4 – 7 days after consumption.